7:1 So the king and Haman went in to feast with Queen Esther. 2 On the second day, as they were drinking wine, the king again said to Esther, “What is your petition, Queen Esther? It shall be granted you. And what is your request? Even to the half of my kingdom, it shall be fulfilled.” 3 Then Queen Esther answered, “If I have won your favor, O king, and if it pleases the king, let my life be given me—that is my petition—and the lives of my people—that is my request. 4 For we have been sold, I and my people, to be destroyed, to be killed, and to be annihilated. If we had been sold merely as slaves, men and women, I would have held my peace; but no enemy can compensate for this damage to the king.” 5 Then King Ahasuerus said to Queen Esther, “Who is he, and where is he, who has presumed to do this?” 6 Esther said, “A foe and enemy, this wicked Haman!” Then Haman was terrified before the king and the queen. 7 The king rose from the feast in wrath and went into the palace garden, but Haman stayed to beg his life from Queen Esther, for he saw that the king had determined to destroy him. 8 When the king returned from the palace garden to the banquet hall, Haman had thrown himself on the couch where Esther was reclining; and the king said, “Will he even assault the queen in my presence, in my own house?” As the words left the mouth of the king, they covered Haman’s face. 9 Then Harbona, one of the eunuchs in attendance on the king, said, “Look, the very gallows that Haman has prepared for Mordecai, whose word saved the king, stands at Haman’s house, fifty cubits high.” And the king said, “Hang him on that.” 10 So they hanged Haman on the gallows that he had prepared for Mordecai. Then the anger of the king abated. 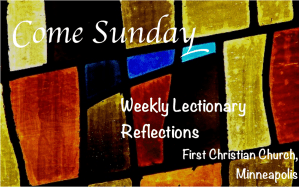 The lectionary invites us to make a quick stop in the Book of Esther. This is the only lectionary stop, which means a lot of context is lost. We would need to reconstruct the context to fully appreciate the message, but perhaps the lectionary creators would have us consider the origins of the Jewish festival of Purim, which is rooted here in Esther. There’s not time or space here to fully reconstruct, but it’s worth noting that this story is somewhat unique in that it never mention’s the name of God. In fact, God is not really an actor in this story. It is the human participants who do what they need to do to survive. We can, if we wish, read between the lines, filling in the white space with a theological component. Of course, the fact that God isn’t mentioned made this a good book to use to learn Hebrew (thus, we used this book when I took Hebrew many years ago). This is a rather untheological book (which is why we used it to learn Hebrew in seminary). To give a brief foundation to our story, Esther is set in the post-exilic period, after the Persians had displaced the Babylonian Empire, and the exile had been ended. This story features two Jews who remain behind in the Persian capital. One of the figures is perhaps a minor official in the king’s service, a man named Mordecai. The second person is Mordecai’s cousin and adopted daughter, who is named Esther. In the course of the story, Esther becomes queen of Persia, putting her in a position to help her people when under threat. Esther becomes queen of Persia after the former queen, Vashti was dethroned, because she refused to dance for husband’s friends. As time passed, the king was feeling lonely and regretting ridding himself of Vashti, so his servants suggested finding another queen. That led to an empire-wide search, a beauty pageant, and the selection of Esther as the new queen (apparently with some help from Mordecai, who saw this as an opportunity to protect himself and his people should a threat arise. Remember, for the Jewish people survival was always in doubt). There are two other figures to take note of here. The first is the king, Ahasuerus [possibly Xerxes (486-465 BCE)]. The second figure is Haman, the king’s first minister, who became annoyed when Mordecai refused to bow to him. In response, Haman devised a plot to get rid of Mordecai, along with Mordecai’s people. In other words, Haman threatened genocide. Fortunately, Mordecai gets wind of the plot and calls upon his adopted daughter, now the queen, to intervene. It will take some convincing, because even queens must be invited into the presence of the king. So, she must devise a plan to get him in her presence, so she can make the big reveal. That leads to a series of banquets. One of things you’ll notice in Esther is that there are lots of banquets and feasts. Some of them last for lengthy period. They like their wine and food! That is where we pick up the story in chapter seven of Esther. The Queen and Mordecai have conceived a plot to out Haman. To do this, she has scheduled a more intimate dinner party, inviting both the king, who in this story is easily manipulated, and his chief minister, Haman. Of course, Haman is excited to have been invited to dine with the queen and her husband. Apparently, to this point Haman has connected Esther and Mordecai (why we’re not told, except that Mordecai had made sure that Esther not reveal her true ethnic identity). He’s just excited about the party. As for the king, he likes to party. Then there’s Esther, who must be careful, for Haman is an important and respected servant of the king (if a bit arrogant). Will the king believe her? Will she, in revealing her identity, cause the king problems? This was a risky venture, but Mordecai had assured her that this is why she had become queen. It was for a time like this, when she could protect her people. When the passage begins, the king and Haman have arrived at the party and are having a great time, until Esther decides to rock the boat and bring up a rather unsavory topic. That topic was a plot to destroy her people, and her with it. Now, this got the king’s attention because he was very attracted to Esther. But that’s not all, she was savvy, and she suggested that if she and her people were to be destroyed, this would dishonor the king. With that, she has the upper hand. She has manipulated both the king and the henchman who sought the destruction of her people. When asked who the culprit was, she pointed her finger at the king’s chief minister, Haman, who was jealous of Mordecai. The king gets angry and storms out of the room, only to return to find his chief minister throwing himself on the queen. Verses 8-9, which describe Haman throwing himself on the queen, not to assault her, as the king thought, but to beg for his life, are omitted in the Revised Common Lectionary. While verses 8-9 might not be included in the lectionary reading, they are helpful in truly understanding the fullness of the king’s anger. Whatever Haman thought he might accomplish by begging for his life was now impossible. The king might have spared him before, but not now. At this the king’s sermon points to the gallows being built outside for Mordecai, suggesting that they might now be used to execute Haman. It is worth noting that Harbona, the servant, reminds the king that it was Mordecai who warned the king of the plot against his life. Thus, Haman is executed, and the king’s anger subsides. It’s all a rather exciting story that might even be useful in our day, as the question of sexual assault and harassment has become an important conversation. Of course, the situations are very different, as is the cultural context. The king might be more concerned about an assault on someone who is his property than her safety. In any case, the sight of Haman near his wife only compounded the situation revealed by the Queen. With this story revealed, we jump down into chapter 9, where we find Mordecai writing a letter to all the Jews in the Empire, asking that they gather for an annual festival on the fourteenth and fifteenth days of Adar, to celebrate the moment when the Jews gained relief from their enemies, and as the month that had been turned for them from sorrow into gladness and from mourning into a holiday.” The festival so-noted is Purim. In our own day it’s not only political leaders that hold the fate of whole peoples in their hand, but corporations and international agreements as well as economic, political, and social systems. How is the church working together with vulnerable people to analyze and alter those forces that treat people as expendable? [Preaching God’s Transforming Justice, p. 416]. What might we learn from the story of Esther and Mordecai? Might we discern that God has empowered us to take on the powers that be? We have been equipped for this task. Mordecai and Esther were from a small and marginal people, and yet they stood toe to toe with a mighty empire and not only survived but stood tall in the world. And as Mordecai reminded his people, this was something to celebrate! One other suggestion, if one is preaching the text, it might be worth encouraging the congregation to read the entire story. Picture Attribution: Victors, Jan, 1619-1676. Esther and Haman before Ahasuerus, from Art in the Christian Tradition, a project of the Vanderbilt Divinity Library, Nashville, TN. http://diglib.library.vanderbilt.edu/act-imagelink.pl?RC=54179 [retrieved September 24, 2018]. 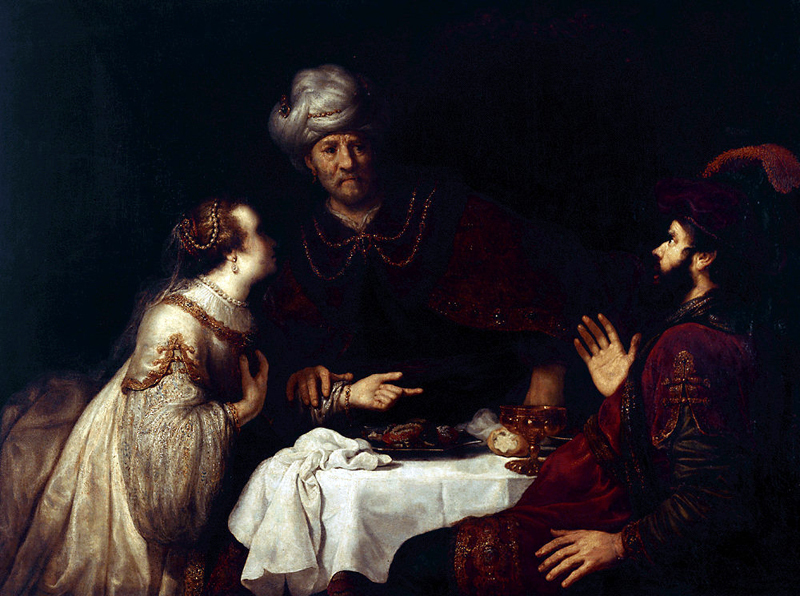 Original source: http://commons.wikimedia.org/wiki/File:Jan_Victors_-_Esther_en_Haman_voor_Ahasverus.jpg. The prophetic call came to Samuel when he was a child. It was during the priesthood of Eli, and according to the narrative, Eli was old, ineffective, and his sons were untrustworthy (1 Samuel 3). Now, we move decades into the future. Samuel is now the one who is old. He’s still considered wise and trustworthy, but the same cannot be said for his sons. Facing the prospect of the instability of an unknown future, to people decide it’s time for a change in political systems. What existed was the leadership of Judges, those charismatic leaders who emerged during times of trouble to lead the people. Samuel is but the most recent of these figures. That system which waits for God to provide a leader at the right time didn’t provide the stability that the people craved. The world around them was dangerous. They felt the need for a stronger leader; a military leader who could defend them and their lands against the encroachments of neighboring peoples. Since their neighbors had kings, why couldn’t they have a king? After all, the neighbors seemed to be in a better position militarily than was true for them. Why get beat up, when you could have a king to fight your battles for you. The request made of Samuel, that he provide them with a king, didn’t sit well with him. Perhaps there was a bit of sour grapes here, but he felt the need to bring his concerns to God. He seems to feel as if his leadership was being rejected, but then maybe he should have seen it coming. After all, his predecessor was rejected because own sons weren’t prepared to lead the nation. The same seems to be true of Samuel. The question raised here, however, concerns whether monarchy is the course of action? More specifically, what does this request say about the people’s view of the covenant relationship that Yahweh had established with them? When Samuel takes his concerns to God, Yahweh tells Samuel that the people aren’t really rejecting Samuel as their leader, what they’re rejecting is God’s kingship. This doesn’t mean they were opting for a separation of church and state. The ancient peoples didn’t separate secular from sacred. Kingship was just as sacred as priesthood. Often these ancient monarchs were understood to have their own sense of divinity. Asking for a king could be seen as a transfer of loyalty from one God to another, with the king being a rival deity. Thus, by rejecting Samuel, the people were perhaps looking for a new deity. While Samuel isn’t happy, nor apparently God either, God tells Samuel to do as the people request. They want a king, then give them a king. However, let them know what this means. Warn them and witness against them. They think this will make things better, but it’s not true. The people will essentially place themselves in a position of slavery, something that Yahweh had rescued them from. In other words, by asking for a king, they were asking for Pharaoh. God sends Samuel to the people with a lengthy warning. It is clear that the point of having a king is to have a military form of government. Watch out, Samuel informs the people. The king will build a standing army by drafting your young men to drive the king’s chariots and horses. There will be commanders of troops established. Not only will there be soldiers in the service of the king, but the king will need people to tend his fields and make instruments of war. Not only will the king require the services of the young men, but the women as well who will serve as perfumers, cooks, and bakers. As Mel Brooks’ character declares in History of the World Part One, “it’s good to be the king.” You can also hear echoes of President Dwight D. Eisenhower’s warning about the “military industrial complex.” As we know, the “Defense” budget is the largest component of our nation’s governmental expenditures. Here again it is likely that Samuel’s speech reflects Israel’s experience in later history. Not only were the excesses described by Samuel typical of subsequent Israelite kings, the same royal offenses were later viewed as responsible for the eventual downfall of both the monarchy and the Israelite nation. After the Exile, even after they had returned to their land, the Israelites continued to perceive themselves as “slaves” (Ezra 9:8-9; Neh. 9:36), a situation attributed to the errant leadership of the kings and other leaders within pre-exilic, society: “Even when they were in their own kingdom . . . they did not serve you” (Neh. 9:34-35). [Stephen Chapman, 1Samuel as Christian Scripture, 99]. The message to the returning Exiles is simple. Having a king isn’t all that it was cracked up to be. In exchange for protection you gave up your freedom. Was it worth it? Ultimately, as Chapman notes, Scripture doesn’t demonize monarchy, but it does point out the challenges. There are always trade offs when it comes to government. The charismatic leadership of the period of the Judges was not without its challenges. At least with the monarchy there was a sense of stability. Yet, there is also the reminder that this arrangement is not God’s best. It is simply the reality we live with. Living as we do in a time of political instability in the United States and elsewhere; at a time when authoritarianism is raising its head in our midst, what lesson do we glean? There are those in our midst—religious folk—who have put their hopes in the hands of a man who has demonstrated few qualities one would deem Christian. In the past, a person like the current President would have been rejected by those who now hail him as their protector. As we consider this passage, what might 1 Samuel tell us about putting our hopes in authoritarian leaders? A passage like this could serve as a reminder that as the people of God we are called upon to put our allegiance not in a human leader, whether monarch or president, but in God. The request for a king will lead to the call of Saul, a man who looks good on the outside, but who ultimately fails to fulfill his potential. While not demonizing the monarchy, or any governmental system, the passage does remind us that privilege often comes with office, and that privilege often comes at a cost, even in a democracy. Nonetheless, after Samuel bears witness to the dangers of monarchy, the people remain unswayed. They’re quite clear as to what they want, and they let Samuel what it is they want: “No! 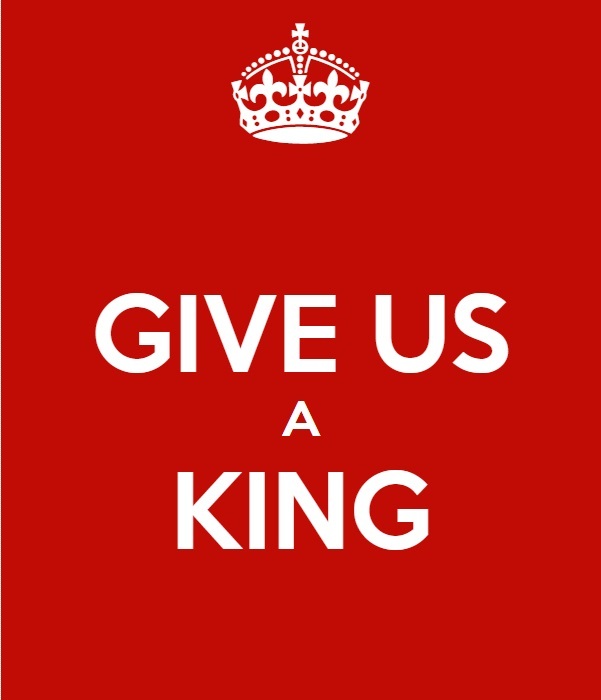 but we are determined to have a king over us, so that we also may be like other nations, and that our king may govern us and go out before us and fight our battles.” People want to get on with their lives. They want a ruler to tell them what to do and then go out and fight their battles. It would seem to me that little has changed over the millennia. As we consider this reading, what might it say to us about our current situation and the realm of God. What does it say about allegiance? We have reached the penultimate moment in the Lenten journey. Christians, at least in the West, will be observing Palm Sunday, or perhaps Passion Sunday. I have always approached Palm Sunday with a bit of unease. After all, the triumphal nature of the day is fleeting. So, perhaps focusing on the Passion is more appropriate, even if we might regather on Friday to hear again the passion story. The reading from Isaiah 50, which forms the third Servant Song, has been read by Christians, along with the other Servant Songs, down the centuries as descriptions of the suffering Jesus experienced as he went to the cross. While the fourth Servant Song is the most revelatory when it comes to the Servant’s suffering (Isa. 52:13-53:12), this Song offers insight into his experience as one who was struck and bruised, but vindicated. In this reading for Passion Sunday, we hear this promise of vindication, making clear that the attacks on the servant are not the last word. As we hear this message to the church in preparation for Holy Week, we should go behind the text to the original audience. That audience was likely the Judean exiles. Sometimes Judah itself is the Suffering Servant. In this case, it could be the prophet. The question is, should we focus on the suffering or the vindication? Christopher Seitz notes, following Claus Westermann, that this poem, and it is a poem/song, should not be read as a lament, but rather as a “psalm of confidence.” There is no complaint offered. Suffering is acknowledged, but it leads to a statement of confidence in the God who vindicates [“Isaiah 40-66,” New Interpreter’s Bible, (Abingdon Press), 6:436]. The prophet declares with confidence in verse 7: “The Lord God helps me; therefore, I have not been disgraced; therefore, I have set my face like flint, and I know that I shall not be put to shame.” The prophet, who has been called to teach the people, and has listened to the voice of God, has faced challenges, but because God is the helper, the prophet will not be disgraced or put to shame. Rather than be disgraced or shamed, the prophet is vindicated by God. When read within the context of Passion Sunday, the reading from Isaiah is a reminder that despite the suffering that Jesus experienced, God vindicated him through the resurrection. For Israel, despite the suffering it had experienced in the Exile, it would be reconstituted. Israel would be resurrected. Taken together, Israel/Jesus are vindicated by God. Teresa Lockhart Stricklen notes that the while the Servant Community looks weak and defeated, “the power of the unseen God is at work to reconstitute that community and thereby reveal the power and purposes of the God of Israel.” Christians look to “Jesus on the cross, like Israel in exile, appeared to be weak and defeated, but God raised Jesus from the dead, thus again affirming God’s power and life-giving purposes” [Preaching God’s Transforming Justice, (WJK Press), p. 185]. The resurrection, like the reconstitution of Israel is God’s vindication. So, who can contend with those whom God vindicates and helps? If God helps, then who can declare Israel/the Prophet/Jesus guilty? We can take this passage a step further. Rather than focus on the question of the identity of the Suffering Servant, we can ask the question of what it means for us to be servants of God, even in the face of resistance and persecution. How might we be the teachers who are awakened by God, so that we might share the God News, knowing that God helps and vindicates? Jon Berquist points us in that direction. He notes that when reading this in our Lenten context, we hear a word concerning our own calling. Lent has emphasized confession, repentance, humility, submission to God’s will, and the desire to recommit one’s self to the work of God in the world. With these concerns framing our approach to the text, we understand Isaiah’s call to be servants and teachers, to sustain others while realizing that we are still learners ourselves, to live out our own vulnerabilities, to recognize that only God will save us from the persecutions and rejections of the world that will inevitably result from our commitment to God’s purposes, and to know that God’s salvation will come only through our persistence in the work of serving and teaching in the face mounting opposition. [Feasting on the Word, (WJK Press), p. 163]. Jesus faced his own tormenters, putting his face forward like flint. Israel did the same. Shall we follow their lead? The good news here is that we can go forth into Holy Week with confidence, knowing that God is our help. God is our vindicator. No one can stand against God, so let us stand together and move forward with boldness on the path set before us by Jesus. Sermon: “The Healing Power of Collard Greens”. I love good food, and it probably shows. I consider myself lucky to be born in the family that I’m in, because I grew up with two wonderful cooking traditions. On my father’s side is the African American tradition of the Deep South. It’s a tradition of fried chicken, collard greens, mac and cheese, cornbread stuffing and sweet potato pie. It is all fattening and it’s all good. Continue reading Sermon: “The Healing Power of Collard Greens”. Being from Michigan and having two parents who worked in the auto plants, I tend to have a fascination with cars. I tend like most cars, but for a long time, I didn’t have much interest in SUVs. Ah, the SUV-Sport Utility Vehicle. In the late 90s it ruled American suburbs. It seemed that ever auto maker had to make one, and the kept getting bigger and bigger. Remember the Hummer? I remember someone telling me the big Ford Expedition got something like 9 miles to the gallon. I remember thinking how horrible that was. I saw SUVs as a scourge, harming the environment and making us lazy. The first decade of the new century set up conflict between those that loved the big gas guzzling SUVs and those that loved the fuel sipping hybrids. For a while there, a campaign made news urging people to use less resource heavy transportation than the SUV. 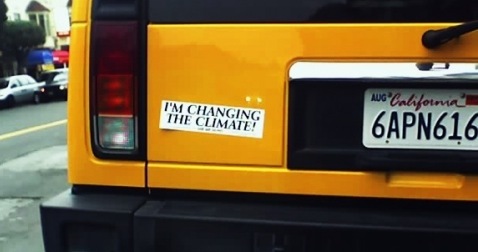 The campaign came up with these simple words: “What would Jesus Drive?” The answer was that Jesus wasn’t going to be driving a Hummer anytime soon. When I think about this week’s gospel lesson, I have to think of it in terms of cars. (I even did a sermon based on the Prius back in 2007.) I can see the Pharisee driving a Prius to the temple. He gets out and starts praying to God, “thanking” God for making all the right choices. He shops at Whole Foods, recycles and even drives Prius (his second Prius, by the way). “I thank you God, that I am not like that guy,” he says guestering at the SUV pulling up to the curb. Another man climbs down from the tall vehicle. He slams the door and falls down to the ground. He’s behind on his mortgage, his oldest son and his son’s wife won’t leave to find a place of their own. His wife was laid off her job the week before and she found out about the affair he was having. She was tired of dealing with his philandering and his alcoholism to boot. After 18 years, she is ready for a divorce. The reason the Pharisee didn’t go home justified isn’t because he did something wrong. He did all the right things. What he missed is relying on God’s mercy; to know that even if he did the right things, he was still in need of God- something that the tax collector understood all too well. As we head to church this Sunday, I pray that we can not get caught up in doing the right things, but instead realize that we are made righteous not because of what we have done, but because of what God has done. By the way, I think Jesus would have taken public transportation, but that’s for another time. 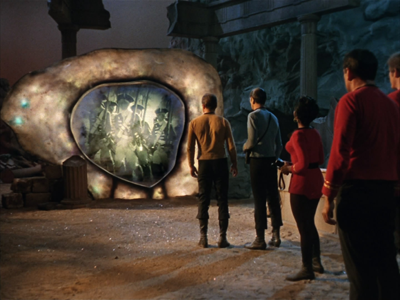 One of the best episodes of the TV series “Star Trek” is one called “The City On the Edge of Forever.” Dr. McCoy gets an accidental overdose of drug that makes him mad. He beams down to a planet with Kirk and Spock right behind him. They arrive on the planet and stand in front of what seems like the largest TV I’ve ever seen. McCoy, still in his drugged state, leaps into what is called the Guardian of Forever. The minute he goes in, the landing party loses contact with the Enterprise. We find out that McCoy has somehow changed history, causing the Enterprise to not exist. Spock and Kirk enter the portal and find themselves in Depression-era America. The two meet a young woman who works at a soup kitchen. She is a peace activist that was supposed to die in a car accident. However, McCoy saves her from getting hit by a car. His one action caused a series of other actions that lead to the timeline radically changing. Edith is able to lead a nationwide peace movement that keeps the United States out of World War II. This allowed Nazi Germany to develop the atomic bomb and win the war. To make a long story short, Kirk stops McCoy from saving Edith from the oncoming car. Edith dies and the timeline is restored, but at a terrible cost. In last week’s blog post, I talked about how faith is about doing something for God without knowing how the story ends. This week’s passage in Hebrews has me thinking about how our actions have implications far beyond our own time. The passage talks about how so many folks acted on faith and didn’t face happy endings. They were faced with a choice and in faith decided to follow one road. Because Abraham believed, a nation was born. Because the Israelite believed, they could cross the Red Sea on dry land. Choices were made that shaped our future. What comes to mind for this coming Sunday is about how so many churches and religious agencies are facing tight budgets. Many churches struggle to make ends meet. Others end up closing. It’s easy to look at our sanctuaries, which were once empty and are now barely occupied and wonder if God can work with our faith community. 39-40 Not one of these people, even though their lives of faith were exemplary, got their hands on what was promised. God had a better plan for us: that their faith and our faith would come together to make one completed whole, their lives of faith not complete apart from ours. King saw that he was part of something bigger than himself. He knew that he was doing God’s work and he had the eyes of faith to see what the completed work would look like. As followers of Jesus, we need to remind ourselves that our actions matter. We might not see the ending, but we can know that we part of the great cloud of witnesses that will have an effect on people generations from now. I preached a sermon in 2010 based on the Hebrews text. You can read it here. 20 “Just then God showed up and said, ‘Fool! Tonight you die. And your barnful of goods—who gets it? When I was a kid, I loved the fable of the Ant and the Grasshopper. The Ant was the serious type and worked hard to prepare for the coming winter. The Grasshopper was more of the free spirit who didn’t worry much about anything, especially the future. 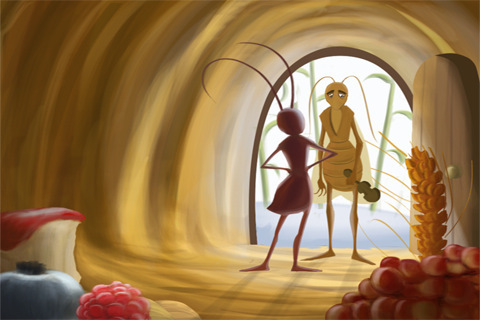 The story ends with winter arriving and the Ant all cozy in his modest two bedroom apartment. Meanwhile the Grasshopper is shivering in the biting winds, hungry and wondering what will happen to him. I wanted to be that Ant. I wanted to prepare for the winter and I even remember telling my mother one morning as I was getting ready for school that we needed to prepare for the oncoming Michigan winter, just like the Ant. In today’s passage, we see Jesus telling a story of his own. In this one the rich farmer ends up with a big harvest. He ends up building large barns to store his harvest and he then decides to kick back, relax and enjoy life, a little like that Ant in that children’s fable. Except this time, God comes in and tells the farmer that he will die this evening and all of big earnings will be of no use to him. In this tale, the Ant doesn’t fare so well. What was wrong with the farmer? In one case, nothing. He had a big harvest on his hands. He had worked hard for this and wanted to enjoy it. It’s hard to see this guy as greedy; I mean he is just enjoying the fruit of his labor. Maybe that’s why this story is so upsetting- because the farmer’s greed doesn’t look like greed. Most of us in his place would probably do the same thing and in fact, we do that all the time. We buy things telling ourselves that we need them and it doesn’t really look like we are being greedy-we’re just enjoying life. Was the farmer greedy because he didn’t share what he had with others? The harvest ends up in the barns. 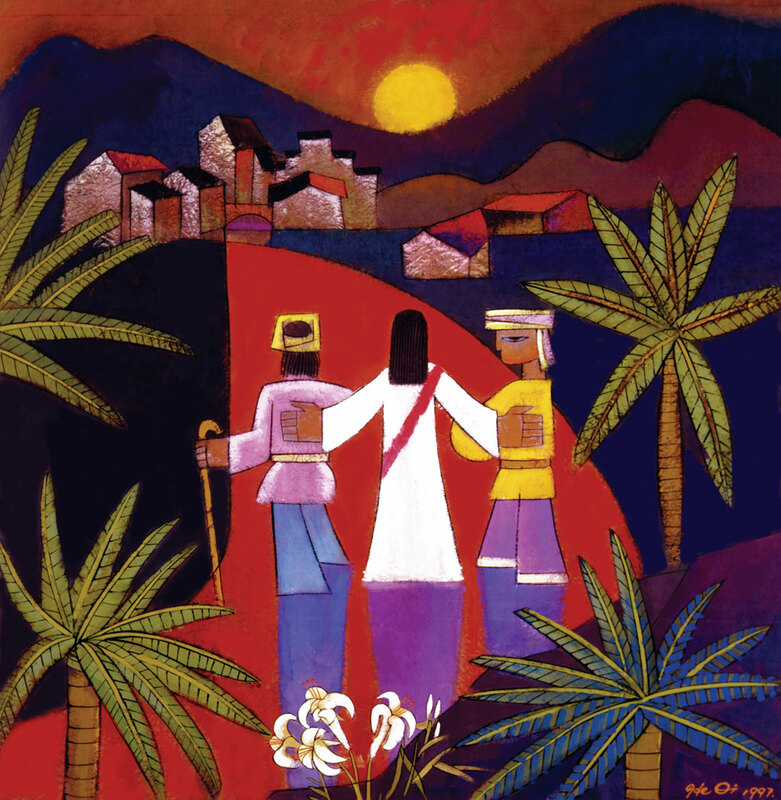 What would have happened had he shared the harvest with others? What if we saw the bounty not as an occasion to pat ourselves on the back, but to be generous to others? Jesus tells the story of the greedy farmer as the Message calls it, in response to a man who wants his bother to share their inheritance. Theologian Russell Rathburn notes that the man is probably the younger brother who in that time and place was entitled to a smaller share than his older brother. The younger brother wasn’t happy with what he had, he wanted more than his fair share. So Jesus then tells what has to be the first stewardship sermon. As followers of Jesus, we are called to place everything at God’s feet and that includes our finances. We are called to be wise stewards. We are called to be generous with what we have. And we aren’t called to build bigger houses…I mean barns to store our stuff…or harvest. In one version of the Ant and Grasshopper tale, the Grasshopper is left to freeze in the cold. Another version has the Ant taking the Grasshopper in and feeding his fellow insect. I’m going to guess that the first version is the “correct” version of the tale. But I kind of want to believe that the second version still has some validity, for the only reason to show that the wise Ant was not only supposed to be prudent, but also compassionate and generous. Thanks the kind of Ant I want to be. 57 On the road someone asked if he could go along. “I’ll go with you, wherever,” he said. I’ve always had issues with this passage, for the simple reason that it didn’t make sense. Why was Jesus telling that one guy who wanted to follow him that he wouldn’t have a place to stay? Why was he so unconcerned about the man that had to bury his father? Why was Jesus, as Lutheran pastor Russell Rathburn notes, such a jerk? The translation found in the Message bible helps clear things up. Jesus was trying to get people to understand their priorities in life. To the man that said he would follow Jesus wherever he went, Jesus warns him that he might lead the man to some places that were not comfortable. To the man that needed to bury his father, Jesus says he must choose life over death. To the one that wants to say goodbye to his friends and family, says that one that looks back isn’t fit for God’s kingdom. The temptation in modern American society is to make our faith one of many priorities. We want our faith to be predictable if we want faith at all. We want a faith where we are in charge. But here’s the thing: if we are following Jesus, we aren’t in charge. We are following Jesus, and that might take us to some strange places, places we would never dream of going. And maybe that’s why this passage bothers me; it lays bare my desire to be in control, to choose my faith. “…in the church we are stuck with one another, therefore we don’t get the space to come up with our own God. Because when you are stuck with one another, the last thing you would do is invent a God based on humanity. 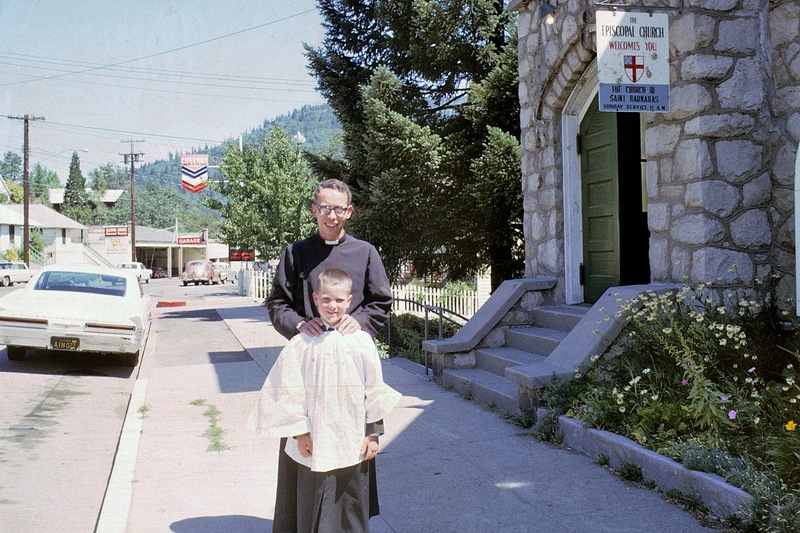 In the church, humanity is way too close at hand to look good. It’s as close as the guy singing out of tune next to you in your pew, as close as the woman who doesn’t have access to a shower and didn’t bathe before worship, as close as the baby screaming and as close as the mother who doesn’t seem to realize that the baby is driving everyone crazy. It’s as close as that same mother who crawled out an inch from her postpartum depression to get herself to church today and wonders if there is a place for her there. It’s as close as the woman sitting next to her, who grieves that she will never give birth to a child and eyes that baby with envy. It’s as close as the preacher who didn’t prepare enough and as close as the listener who is so thirsty for a word that she leans forward for absolutely anything. It’s as close as that teenager who walked to church alone, seeking something more than gratitude, and finds a complicated worship service in which everyone seems to know when to stand and when to sing except for him—but even so, he gets caught up in the beauty of something bigger than his own invention. Jesus Walks. Jesus walks to places we would never consider and that can make us quite uncomfortable. That will make us quite uncomfortable. Jesus had a hard road to walk, but in the end it was so worth it. Our walks with Jesus and encountering the lost and lonely will also make a difference in that we will all see God in places we never would have expected. Jesus Walks. Will you follow? Dennis Sanders is the Associate Pastor at First Christian Church in Minneapolis. 11 The Lord said, “Go out and stand at the mountain before the Lord. The Lord is passing by.” A very strong wind tore through the mountains and broke apart the stones before the Lord. But the Lord wasn’t in the wind. After the wind, there was an earthquake. But the Lord wasn’t in the earthquake. 12 After the earthquake, there was a fire. But the Lord wasn’t in the fire. After the fire, there was a sound. Thin. Quiet. He was only 21. He laid in the hospital bed in silence. I would come by every so often to see how he was doing. The result was a lot of time in silence. You could tell he was angry. You could tell he was depressed. At 21 he had his life ahead of him. But then an ATV accident leaves him without a leg. Depression comes in many ways. Sometimes, it arrives in an angry silence. Sometimes the anger is rather loud. Sometimes it comes in the form of despair. For the prophet Elijah, it came with despair. He felt he did all the right things. But now he was on the run from Queen Jezebel, who has made Elijah a marked man. I’d be depressed too if a homocidal regent is after your head. Depression can be a time when you feel alone. Elijah was feeling very alone. Jezebel had killed most of the prophets of the Lord and Elijah had to leave everything behind. You can feel that God is not simply silent, but just isn’t around. God has left the building. And yet, this passage reminds us that God was with Elijah. Angels offer the prophet of the Lord food to keep up his strength. Finally, God comes to Elijah, not in the busy sounds of the everyday, but in silence. All of us will face those times when it seems like the bottom has fallen out. We stumble through our days and just want to give up. But God is present, maybe not in the way we expect, but God is there. Life will knock us around. Elijah’s story reminds us that God will come to us in those hard times in ways we don’t expect. In. the. still. silence.